Homeowners throughout Ellicott City (and anywhere for that matter) love wood decks for so many reasons. For starters, wood decking is an excellent way to add value to a home, with an average return on investment of 78.6% according to Remodeling Magazine’s annual Cost vs. Value Report for Baltimore. And then there is the curb appeal. Wood decks just look good. Period. End of story. The only downside: maintenance. Wood decks require annual maintenance. The solution:Invest in a Composite Deck! Click Here for a free deck quote from Freedom Fence & Home! With over 40 years of experience in the decking industry, Freedom Fence and Home specializes in Wood, Low Maintenance, and Composite decking. Our crews are highly trained and have been performing deck construction for years. No matter the material you choose, your new deck will last for years and stand up to the elements. Made of a mix of waste wood or cellulose fiber and plastic, composite decking provides all of the benefits you love about wood decking without the annual maintenance. That’s what we like to call a win-win! No need to get down on your hands and knees and stain a composite deck. Yay! Composite decking requires only occasional cleaning. Durability: Composite decks are built to stand up to the toughest weather conditions in and around Ellicott City, from blazing summer sun to mountains of snow and ice. Unlike wood, your composite deck boards will not warp, crack, or rot under such conditions. Curb Appeal: A new deck will instantly add to your home’s curb appeal. Home Value: As we have already mentioned, with an ROI of 78.6%, a composite deck is an excellent way to add value to a home. Outdoor Entertainment: Your new deck is the perfect venue for your next cookout or family dinner. A deck is a great place to entertain friends and family, or just relax and enjoy the great outdoors. Simply put, a new deck gives you additional outdoor living space. Low Maintenance: There is no such this as a NO maintenance deck. Composite decking is, however, low maintenance. Composite materials are easy to clean and maintain. Freedom Fence and Home has been installing composite decks for years. 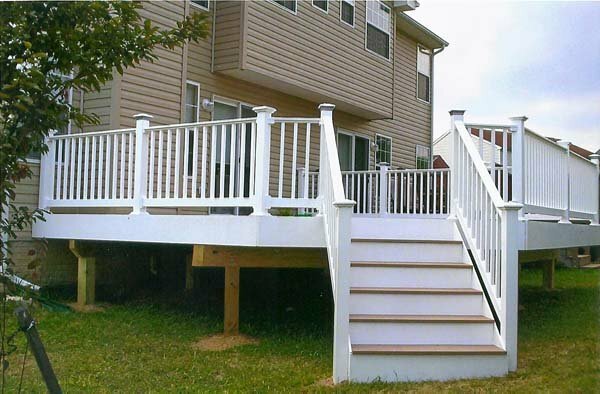 We are extremely familiar with the different composite deck materials available and our crews have used these materials to build single level and multi-level decks throughout Baltimore and Harford counties. If you have any questions about Composite Deck Construction in Ellicott City, please contact Freedom Fence and Home by calling 443-271-6841 or visit our website. You can also follow us on Facebook and Twitter! This entry was posted on Tuesday, September 30th, 2014	at 7:38 pm	. Both comments and pings are currently closed.